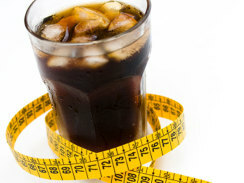 Sorry, soda lovers - even diet drinks can make you fat. That's the word from authors of two new studies, presented Sunday at a meeting of the American Diabetes Association in San Diego. "Data from this and other prospective studies suggest that the promotion of diet sodas as healthy alternatives may be ill-advised" Dr. Helen Hazuda, professor of medicine at University of Texas Health Science Center at San Antonio, said in a written statement. "They may be free of calories, but not of consequences." For one study, researchers at the center followed 474 diet soda drinkers, 65 to 74 years of age, for almost 10 years. 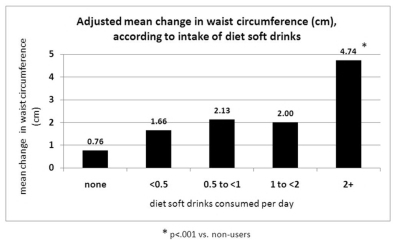 They found that diet soda drinkers' waists grew 70 percent more than non-drinkers. Specifically, drinking two or more diet sodas a day busted belt sizes five times more than people who avoided the stuff entirely. And as waist size grows, so do health risks - including diabetes, heart disease, cancer, and other chronic conditions. Just how does diet soda make you fat? The other study may hold the answer. In it, researchers divided mice into two groups, one of which ate food laced with the popular sweetener aspartame. After three months, the mice eating aspartame-chow had higher blood sugar levels than the mice eating normal food. The authors said their findings could "contribute to the associations observed between diet soda consumption and the risk of diabetes in humans." "Artificial sweeteners could have the effect of triggering appetite but unlike regular sugars they don't deliver something that will squelch the appetite," Sharon Fowler, obesity researcher at UT Health Science Center at San Diego and a co-author on both of these studies, told the Daily Mail. She also said sweeteners could inhibit brain cells that make you feel full. So if sugar soda is no good, and diet soda isn't either - what should we be drinking? Dr. Hazuda told the Daily Mail, "I think prudence would dictate drinking water."